7 a.m., 7:30 a.m. and 8 a.m.
Tickets are $10 and include admission to the program, Zoo admission, and parking. Learn about the banding process and the Milwaukee County Zoo’s role as a stopover site for migrating birds. Learn more about the species of birds on Zoo grounds and the importance of the park’s habitat to migrating birds. You might also have the chance to release a bird! All ages are welcome; pre-registration is required and is online only. Children two and under are free. The earlier your arrival, the greater chance you’ll have to see a bird. Register by Thursday, May 18, 2017. Program requires walking and standing. Zoo opens at 9 a.m. 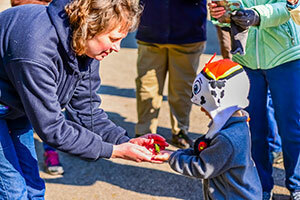 Questions can be directed to: zoo.specialevents@milwaukeecountywi.gov.